As you probably most likely definitely know by now, I love Minted! I get Christmas cards from them every year, and they have such a lovely collection of art prints perfect for any occasion, including for the nursery! 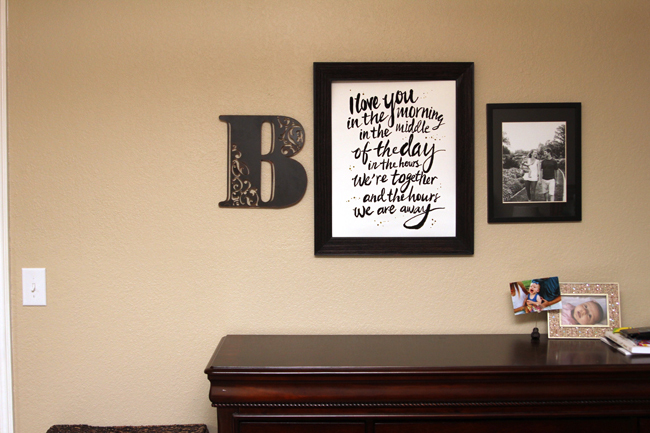 We have a Minted print hanging in R's nursery that I love because it's personalized with her name. Minted reached out to see if I was interested in choosing a print from their Valentine's day art, and of course I said yes. There were a lot of cute prints to choose from (heart eyes for this gorgeous flower print and what about having your wedding vows as a wall print LOVE). I'm also seriously drooling over these custom maps. After much debate, this is the print I chose. I decided to do some rearranging of the photos we had above the dresser in our bedroom, and I love the way my new print fits in! One thing I love about Minted is the originality of their artwork. Along with my print, I received a certificate of authenticity telling me that my print is one of a limited edition of 350. Shipping cutoff dates to receive your Valentine's day artwork by February 13 begins on February 1, but of course you can always buy Minted art prints any time of year! *Affiliate links are used in this post. If you click on a link, I do receive a small commission. All opinions are my own. At first glance I thought the words of that print were the lyrics to that Skidamarink song. Do you know what I'm talking about? I remember singing it at the library as a kid, and then they sang it when I took Gracie to storytime. Anyway, what a sweet quote! I thought it was that song at first, too! I know that song! I hate that song. It gets in your head and never comes out! Aww, I love this! Such a cute piece! I love the print! And Minted does have some really great art! Glad you got a piece for your room. What a great quote. Love the simplicity of it! Bahahaha! You're "real life" comment. Close up pics are how I get it done. My life looks so much more glamorous in pictures than in reality...and I'm not even a good photographer! Such a cute print! Haven't used minted, but I may have to check it out!